After four years, the World’s biggest football tournament is upon us once again. Germany won it in Brazil the last time it was played and in the process made history as the only European nation to win it on Americans’ soil. This year’s edition will be hosted for the first time in Eastern Europe, Russia, and every football die hard has been in position to give their verdict on who they think will win it. PML Daily’s football experts have not been left out, with Allan Ssekamate, Alex B. Atuhaire and Lubega Shaban giving their thoughts on who they think will walk away with the FIFA World Cup 2018. I must confess that I like the Germans so much that I always see them winning every tournament ahead. This applies to this year’s World Cup in Russia, which could turn out to be the most competitive edition in the recent history of the tournament. However, despite my Germany emotional attachments, I am alive to the fact that it is the most difficult of things to replicate World Cup success four years after winning it. This brings me to Brazil, the obvious pre-tournament favourites at this year’s edition. Having spectaturaly collapsed at home to Germany when they hosted the tournament four years ago, Brazil will be buzzing to the final — I believe, and their failure as hosts in the previous tournament will give them extra motivation. Brazil too looks so well balanced in all areas – goalkeeping, defence, midfield and attack, that it’s almost difficult not to admire their depth and beauty. Back to fitness, Neymar Jr will be looking to take center stage and leap to the top of World Football charts. With the two giants above looking to set the pace at the tournament, there are five or so teams that could yet reign on the big party. After all this is the World Cup and we are bound to have the tournament form teams, the dark horses and those that can take their chances as rank outsiders with grit. This group is led by Belgium — and then there is good old Argentina with Lionel Messi — will this be Messi’s year? I must admit that I do not trust Argentina even with Messi-to pull off a tournament success. There is Spain too, with an array of talent and winners and like Argentina; I won’t trust them to light up Russia. We have rank outsiders Portugal, who have before shown they know how to win a tournament out of pure grit and then France, who with an array of talent across board may yet gel and spring surprises. Before I conclude, I will not fail to mention tournament noise makers England and I will lump them together with our African-brother-teams (Egypt and Co) — NO CHANCE in Russia! I would expect this group to perhaps focus on having a good tournament, which could spring surprises in the early stages — nothing more! So, who will win Russia 2018 World Cup? I will go for BELGIUM! They are playing fearless football under Roberto Martinez. They can take on both Brazil and Germany, and pound for pound, thrive. There is a buzz about their squad, which looks so united and happy. They too, are well balanced and have depth and beauty. In Kevin De Bruyne, Eden Hazard and Romelu Lukaku, they have players who can win games and later on a tournament. *** VERDICT: I will therefore give it to BELGIUM, they surely can win it! The chances of us seeing a first time winner at the Russia 2018 finals are minimal. Only Roberto Martinez’s vastly talented Belgium powered by English Premier League stars Eden Hazard and Kevin de Bruyne; and to a less extent Fernando Santos’ European champions Portugal, have a remote chance of challenging previous World Cup winners. If there is any tournament that proves football pedigree matters it’s the World Cup. Since 1930 when the Jules Rimet trophy was first contested, only eight out of over two hundred countries affiliated to world football governing body Fifa have won the World Cup. Only eight. In the past thirty years, only France (1998) and Spain (2010) have broken into an exclusive club of World Cup football aristocrats. I intend to show you why Brazil will contest this year’s final using an elimination process. Among the eight previous winners, four time titlists Italy are out because they didn’t qualify. Among the seven remaining former winners, Uruguay can be discounted. Despite a sprinkling of world class in Diego Godin, Luis Suarez and Edinson Cavani, they lack depth needed to walk away with top honours. This leaves us with Brazil, France, Spain and Germany as the Russia 2018 semifinalists. With all four teams almost level in terms of playing personnel, I am going with Brazil to reach the final ahead of Germany. Tite’s Samba Boys have gone about each and every match with a clearer single minded desire to win whereas Germany take some games for granted. Meanwhile, I am tipping Spain to top France courtesy of Julen Lopetegui’s superior tactical acumen to Didier Deschamps. So my final is Brazil versus Spain. England are the least equipped of the remaining six former winners because they lack star quality and are short on experience. Next to fall off my radar are Argentina as they are an embodiment of inconsistency. The 1978 and 1986 winners are overly dependent on Lionel Messi. They are basically always just a Messi off day away from elimination. *** VERDICT: I will go for a Spain vs Brazil final! For me, it’s between Brazil and Germany. The two greatest sides in World Cup history, Brazil and Germany. Germany showcased their supremacy at the last World Cup by not only winning it but also thrashing, Brazil 7-1 in the semi-finals. 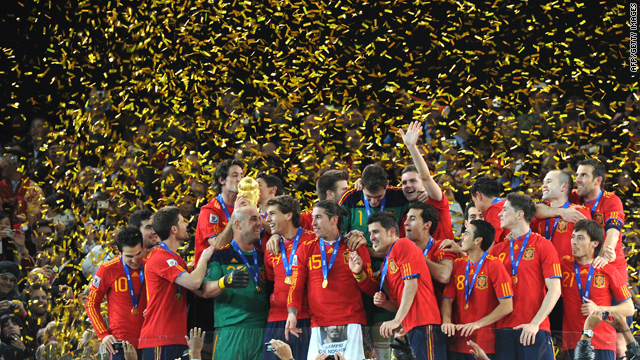 Three years later, they won the Confederations cup with an impressive display despite having a youthful squad. However, they have never won back to back tittles and not even the great 70s side under Helmut Schon could. Before the start of Russia 2018, they have been in the headlines, particular their manager, Joachim Loew for dropping one of the brightest talents in the world at the momento-Leroy Sane in favour of a less proven kid in Julian Brandt. These sort of decision make or break great sides but due to the fact that this side goes into the tournament without anything to prove, i think such decisions will be their undoing. A fifth consecutive semi-finals appearance may be on the cards for them but not a second World Cup on the trot. My pick will have to be Brazil, the one side that has been favorites going into each and every World Cup since 1930. Memories of the 7-1 loss at home in 2014 should still be fresh in their heads and can only spur them on. The appointment of former Corinthians manager, Tite, seems to have rejuvenated a side that looked broken in 2014. He may not have coached in Europe at any point but embraced their style and fed it into a team that boosts of loads of South American styled footballing talents, many of whom play their trade in the top sides of Europe. Brazil looks a shadow of the side from four years ago and with their captain and star player, Neymar Jr fully fit, they are right to believe they can win the trophy for a record sixth time. Their attack boosts of two other seasoned perfomers in Gabrial Jesus and Philip Coutinho. Along with Neymar, they have blown away each and every opponent in South America during the qualifiers. In midfield, Tite prefers the more composed and tactical combination of Paulinho, Casemiro and Chínese based Renato Agusto. They may not be the biggest names in the world but their understanding and athleticism is second to none. When you look at the Selecao’s back-line, they look far better a side than in the recent past. They don’t concede many and also boost of one of the best modern day goalkeepers in the world. Not one but two shot stoppers in Allison and Ederson. There substitutes would be starters at 75% of the teams at this year’s tournament evidence to their depth in squad. Putting all that into consideration, i view Brazil as a complete package and Russia 2018 being their World Cup to lose. *** VERDICT: I will therefore go with Brazil winning it!